Had a long chat with my Dad this afternoon which, while I know his intentions are good, has left me cognitively exhausted. We were chatting about the possibility of me making a career change out of what I’m doing currently (as I had the realisation last week that after only 20 months there, I’m now at the top of my pay scale, which is depressing in and of itself) and maybe putting my aptitude for computers to use. While I see where he’s coming from, the idea doesn’t excite me greatly; sure, I managed to teach myself HTML when I was 13ish, but at 31, I don’t know if I’d be able to pick it up sufficiently to be able to enter the field at my age without any formal qualifications in computer sciences. Plus, I feel that I’d just be moving from one high-stress area to another with little personal reward (i.e. feeling of satisfaction or making a positive difference). What I would love to do is open a sensory and support centre for people on the spectrum, especially support for adults. I have been looking into local support for adults on the spectrum and any groups I’ve found are for parents with children on the spectrum, but not for adults on the spectrum themselves. I work outside my county of residence and in that county’s main city, there are two such support services that I would love to combine into one in my local area. One service is a sensory centre – think like a sensory room in a special school, but several rooms in one place – for children, young people and adults with special needs… I would have so much fun picking out and setting up the sensory toys and objects, lighting and surfaces… It’d be AMAZING. The second service is a social self-help group for adults with Asperger’s Syndrome. As there is nothing like either of these services in my local area, why not use my social work skills to help bring support like this to life? I am certain that there is a viable target audience for it and would love to pioneer this, but I would need help because the businessy side of planning would be overwhelming… plus I have no money to do this and would need help finding whatever funding avenues may be available. I don’t know what the answer is, but I don’t think I can stay where I’m at for much longer because I can see myself burning out, especially because there isn’t much room left for progression and I have no aspirations to become a manager… I don’t envy any of the nonsense the managers in my team contend with on a daily basis. If any readers have any ideas, I’d gladly welcome constructive advice. 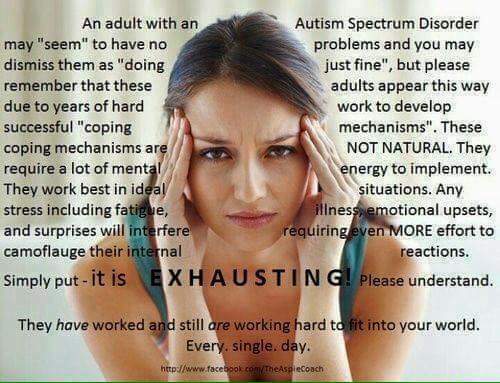 I’ll leave you with an image shared on the Asperger’s Syndrome Awareness – Bryan’s Advocacy page today which resonated quite strongly with me. But to be honest, I like the idea of the services more. I wonder, whether I should do/get tech jobs, do them for a while (I’ve a plan, how much money I had to make, how to invest it and then to live by it for a couple of years) or like working part-time and investing the time left and money in such projects like you’re talking about.